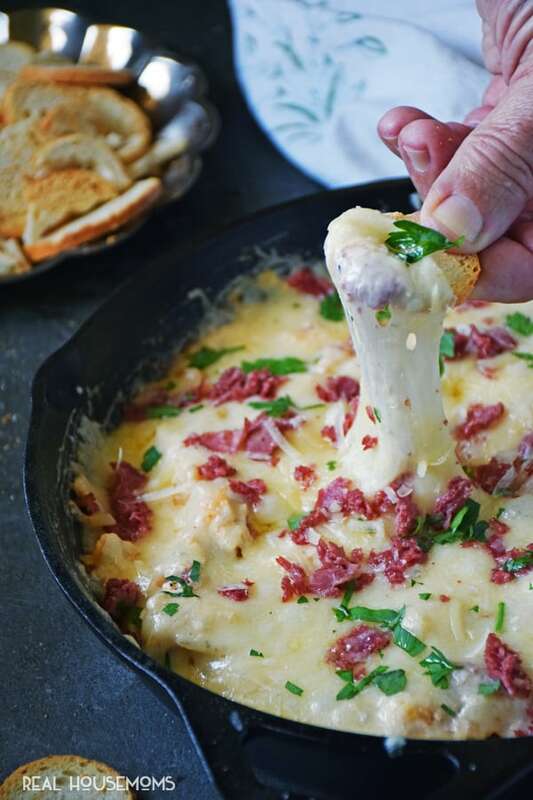 SKILLET REUBEN SANDWICH DIP is a quick & easy recipe that cooks up in about 10 minutes for a party appetizer that’s always a winner! We LOVE a good Reuben sandwich! 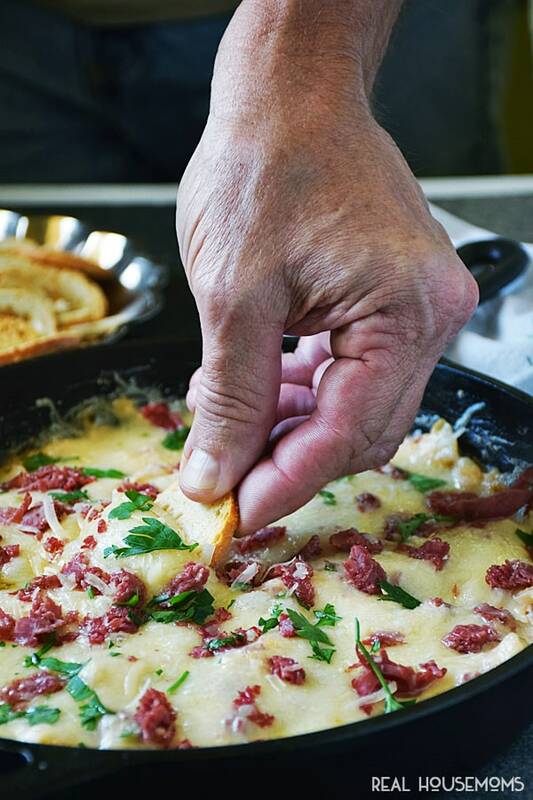 The corned beef, Swiss cheese, sauerkraut, and Russian dressing all grilled between slices of rye bread is sandwich nirvana, but it’s not always quick and easy to make sandwiches for a crowd, which is what inspired me to put all of those amazing flavors into a quick and easy skillet dip. Making dips in a skillet is a favorite of mine. I have about a dozen different skillet dip recipes on my website, Life Tastes Good, and I’m always thinking of new flavor combos to make! 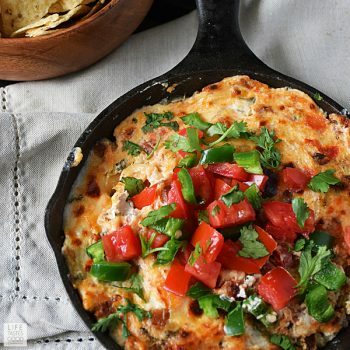 Skillet dips are so easy and ready in about 10 minutes! Because I don’t want to spend all of my time in the kitchen when I can be catching up with friends, quick and easy is what I need when we have a party. Another reason why I love skillet dips is they are so versatile. For this Reuben Dip, you can sub in pastrami and call it a Rachel Sandwich Dip, and everyone will be just as happy. 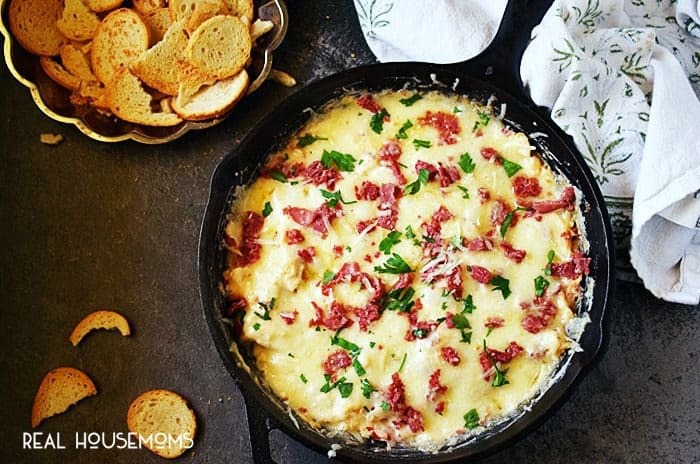 While this dip is versatile, I do like to keep the flavors of the traditional Reuben sandwich, but you can sub in your favorite cheese if you aren’t a fan of Swiss. This dip is cheesy and delicious, so you want to make sure you love the cheese you use! Because the dippers are almost as important as the dip, it’s only fair I share my fave with you. I really like to use baguette pieces for this dip. They come in a variety of flavors and are sturdy enough you don’t have to worry about them breaking when digging in. You could also make this dip up and transfer it to a bread bowl. No matter how you serve it up, it is sure to be a hit at your next party. No doubt everyone will want the recipe too! Enjoy! 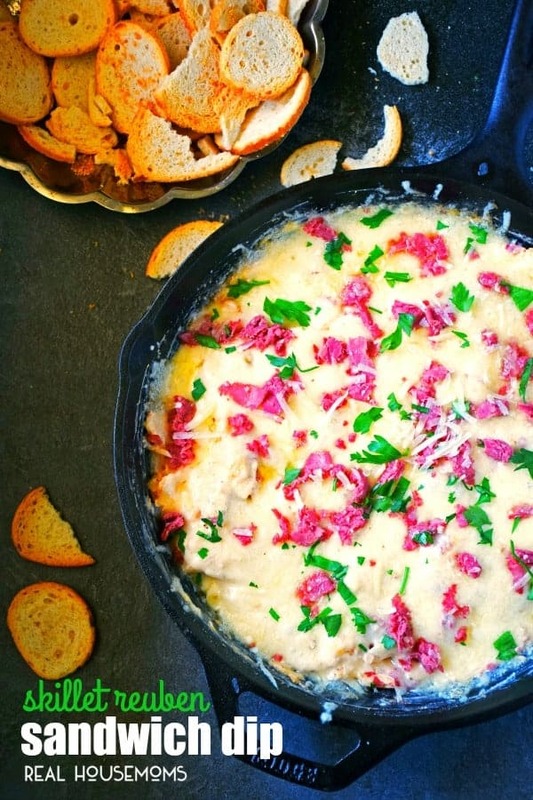 SKILLET REUBEN SANDWICH DIP is a quick & easy recipe that cooks up in about 10 minutes for a party appetizer that's always a winner! Pre-heat oven on <g class="gr_ gr_68 gr-alert gr_spell gr_run_anim ContextualSpelling" id="68" data-gr-id="68">high-broil</g>. In a 10" skillet over medium heat, melt together 8 ounces cream cheese and 1/2 cup Homemade Russian Salad Dressing until combined. Mix in 16 ounces sauerkraut and 8 ounces corned beef. Give it a taste and adjust the flavors as needed. Add salt and pepper to your liking. Top with 8 ounces shredded Swiss cheese and place under broiler to melt the cheese. Remember to leave the oven door ajar when broiling and watch it carefully. It should only take about a minute for the cheese to melt nicely. Remove from oven and garnish with reserved corned beef and chopped parsley. Serve with rye bread and baguette pieces. Enjoy! Another easy skillet dip recipe is my Skillet Jalapeno Popper Dip. It cooks up in no time and tastes just like jalapeno poppers! So good!